Early voting is underway in many states… how about yours? Nov. 6 is officially Election Day , but the election has started right now — thanks to modern-day open absentee and early voting. Voting has already begun in multiple states, including some key swing states: North Carolina, Wisconsin and Virginia. My state, West Virginia, started absentee voting five days ago (ends Oct. 31) and begins in person early voting on October 24 (through Nov. 3). 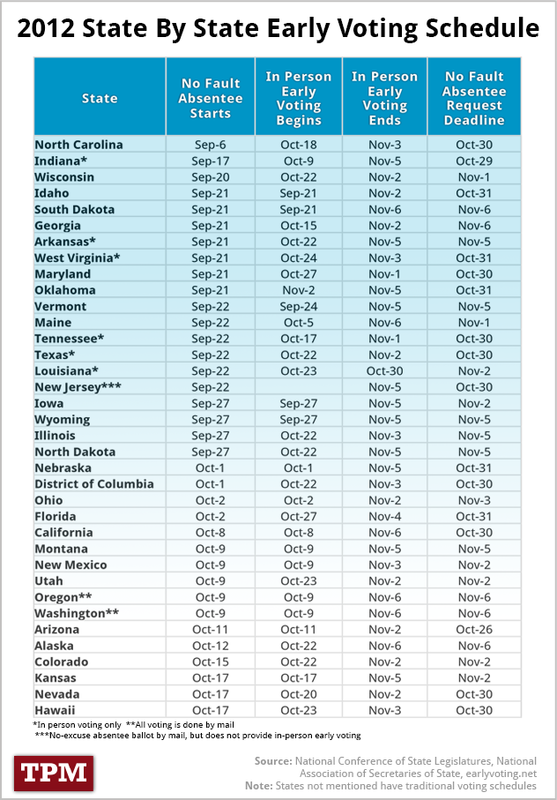 Check the list below and see where your state has early voting. I notice that Connecticut, my original home state, is not on the list (nor is Massachusetts and Rhode Island). Not sure why. Comments Off on Early voting is underway in many states… how about yours? Want to know the results of Florida’s voter restriction program? There are about 2 months left for about 114,000 residents who have been shut out of the vote, be they seniors or blacks or hispanics. We should all be working to clean up this mess. UNITED STATES DISTRICT COURT-MIDDLE DISTRICT OF FLORIDA issued a ruling on August 21 striking down some of the Florida restrictions… especially the trimming down of early voting dates. Comments Off on Want to know the results of Florida’s voter restriction program? We’re entering the last week before the November 2nd election and Tim Kaine, the Democratic Party Chair, is seeing advanced Democratic presence in the states where there is early voting… especially in Nevada… which does not seem to equal the current poll of Independents who are leaning Republican. The President is crossing the country again making even more campaign support speeches for Democrats and the concern seems to be not with Independents, but to make sure a majority of registered Democrats from the 2008 victory come out to vote. We seem to be having a large Democratic turnout in the Jefferson County, WV, early voting… including Elly and me… but I know from the past that Jefferson County is more liberal than most of the state and often presents a different result. Hopefully, however, Governor Manchin will take the Senate if people realize what a danger Raese is to the state. WE can hope… the polls are too close. 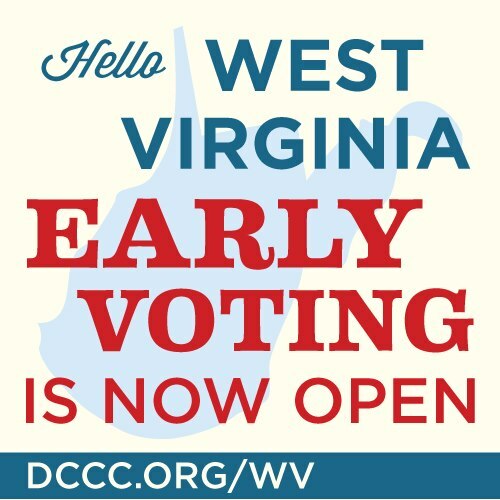 I encourage all the Democrats out there (and all the Independents who have not been suckered in by the Tea Party/Republican positions and statements) to vote and vote early if possible (in my state you have Early Voting until Thursday.) There is too much left to do to bring the Country back from the 8-year Bush destructiveness. There is no need to dig the hole deeper. Interesting… I’m one of those early voters! Election Day is already over for more than 3 million Americans, and a surprising number of them are Democrats. Republicans clearly are gaining ground in turning out early voters compared with their showing two years ago, but figures from the first batch of states that offer clues about 2010 early voting patterns still give Democrats an edge in a number of states and big counties. So far more Democrats than Republicans are casting ballots in Iowa, Maryland, North Carolina, Louisiana and Nevada‘s heavily Democratic Clark County, which supplied two-thirds of the state’s voters in 2008.